I have many black and white photographs taken about half a decade ago. Occasionally I looked at them and reminescence of the happy days I had with my children when they were very young. 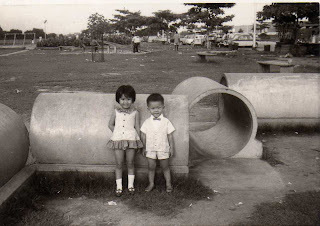 I came across the photos taken at Kallang Park in early 1960. 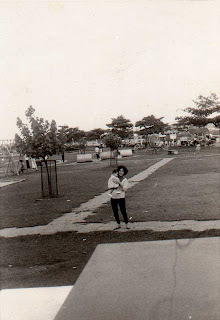 It was a park barren of buildings except for the children's playground. Going to the park was by your own transport as there was no bus service going to the park then. 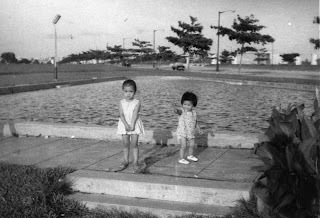 Among the play areas was a wading pool for children to play in the water. It was later filled up with sand and became a sand pit. Children built sand castles and imaginery monuments. 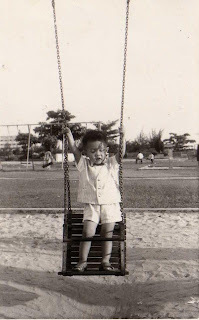 Other play things were sea-saws, swings, slides and merry-go-rounds. In addition there were colourful tunnels for children to play hide and seek. All the play areas were near each other and children moved easily from one to the other. Today the landscape at Kallang Park has been transformed into a sports complex plus entertainment places and food outlets. Soon the famous 'Kallang Roar' National Stadium will make way for the Singapore Sports Hub. This swing was for younger children. It had a seat with safety bars all round. This guy broke the safety rule by standing on the swing. 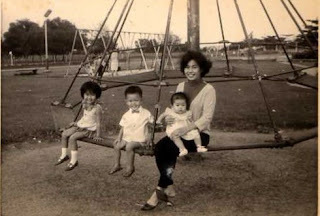 The swings for older children are on the background to the left. Finally, we get to see what's on the other side of laokokok's photo. 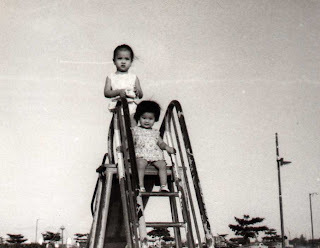 I remembered the playground. Isn't that where the present MacDonald's Restaurant is? Later it was redeveloped to the SHELL traffic games site. 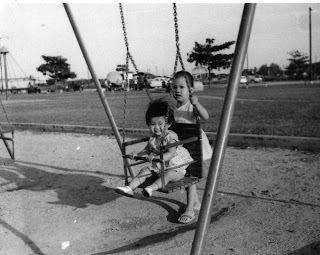 I wonder whether you have photos of the roundabout in front of the Kallang Park and photo of a block of flats at Dakota Crescent which had a neon advertizing signboard? Hi professor, the playground was not at the present MacDonald Restauirant site. 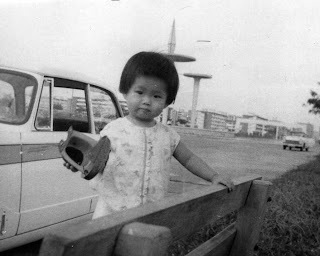 It was at the National Stadium. I do not have the photo of the roundabout or the flats at Dakota Crescent. 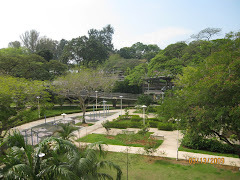 i had heard of kallang park but had never been. Ya, I played at the playground before. The merry-go-round brought back my "almost lost" memory. Thanks! I remember the merry-go-round was quite jerky. It could carry many kids in one go. It offered free entertainments in those days. Yes, I too remember that the merry-go-round was quite jerky. Thinking about it now, I took the risk by putting my kids there.